Third-Worldism is a political concept and ideology that emerged in the late 1940s or early 1950s during the Cold War and tried to generate unity among the nations that did not want to take sides between the United States and the Soviet Union. The concept is closely related but not identical to the political theory of Maoism-Third Worldism. The political thinkers and leaders of Third-Worldism argued that the North-South divisions and conflicts were of primary political importance compared to the East-West opposition of the Cold War period. In the Three-World Model, the countries of the First World were the ones allied to the United States. These nations had, and still have, less political risk, better functioning democracy and economic stability, as well as higher standard of living. The Second World designation referred to the former industrial socialist states under the influence of the Soviet Union. The Third World hence defined countries that remained non-aligned with either NATO, or the Communist Bloc. The Third World was normally seen to include many countries with colonial pasts in Africa, Latin America, Oceania and Asia. It was also sometimes taken as synonymous with countries in the Non-Aligned Movement, connected to the world economic division as "periphery" countries in the world system that is dominated by the "core" countries. Third-Worldism was connected to new political movements following the Decolonization and new forms of regionalism that emerged in the erstwhile colonies of Asia, Africa, and the Middle-East, as well as in the older nation-states of Latin America : pan-arabism, pan-africanism, pan-americanism and pan-asianism. 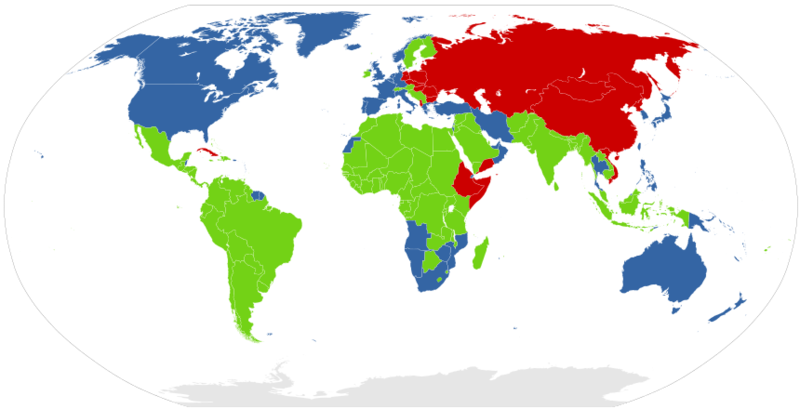 The "three worlds" of the Cold War era, as of the period between April 1975 and August 1975. Neutral and non-aligned countries shown in green. The first period of the Third-World movement, that of the "first Bandung Era", was led by the Egyptian, Indonesian and Indian heads of states : Nasser, Sukarno and Nehru. They were followed in the 1960s and 1970s by a second generation of Third-Worldist governments that emphasized on a more radical and revolutionary socialist vision, personified by the figure of Che Guevara. Finally at the end of the Cold War in the late 1980s, Third Worldism began to enter into a period of decline. Several leaders have been associated with the Third-Worldism movement. ^ "The Third Worldist Moment - ProQuest" (PDF). search.proquest.com. Retrieved 2016-10-04. The Afro-Asian People's Solidarity Organisation (AAPSO) is an international non-governmental organization dedicated to the ideals of national liberation and Third World solidarity. The organization is based in Egypt and has around 26-50 staff.The AAPSO was founded as the Solidarity Council of the Afro-Asian Countries at a conference held in Cairo December 1957 to January 1958. The name was changed to its present form at the second conference held in Conakry, Guinea in April 1960. The AAPSO has 90 national committees. The Soviet Afro-Asian Solidarity Committee was a charter member. Observer status was held by the World Federation of Trade Unions, World Federation of Democratic Youth, Women's International Democratic Federation and the World Peace Council. The Asian–African Legal Consultative Organization (AALCO) is an international governmental organization formed in 1956, initially to serve as an advisory board to member states on matters on international law. It was an outgrowth of the Bandung Conference, held in Indonesia during April, 1955, which led to the establishment of the Asian Legal Consultative Committee (ALCC). In April, 1958, it changed its name to the Asian-African Legal Consultative Committee (AALCC) to reflect the growth of its membership beyond the African side of the United Arab Republic. Since 2001, it has been known by its current name, the AALCO, reflecting the growth of its international status; currently an intergovernmental organization having received a standing United Nations invitation to participate as an observer in the sessions and the work of the General Assembly and maintaining a permanent office at Headquarters. In 2014, the AALCO established an Informal Expert Group on Customary International Law. That group adopted a set of comments on the work of the International Law Commission on identification of customary international law. Those comments and the report of the AALCO Special Rapporteur Sienho Yee are published on the website of the AALCO. The Games of the New Emerging Forces (GANEFO) were the games set up by Indonesia as a counter to the Olympic Games. Established for the athletes of the so-called "emerging nations" (mainly newly independent socialist states), GANEFO was the name given both to the games held in Jakarta in 1963 and the 36-member sporting federation established the same year. A second GANEFO scheduled for Cairo in 1967 was cancelled and GANEFO had only one subsequent event, an "Asian GANEFO" held in Phnom Penh in 1966. The Arab Socialist Ba'ath Party (Arabic: حزب البعث العربي الاشتراكي‎ Hizb Al-Ba'ath Al-'Arabi Al-Ishtiraki) was a political party mixing Arab nationalist and Arab socialist interests, opposed to Western imperialism, and calling for the renaissance or resurrection and unification of the Arab world into a single state. Ba'ath is also spelled Ba'th or Baath and means "rebirth," "resurrection," "restoration," or "renaissance" (reddyah). Its motto — "Unity, Liberty, Socialism" (wahda, hurriya, ishtirakiya) — refers to Arab unity, and freedom from non-Arab control and interference. Its ideology of Arab socialism is notably different in origins and practice from classical Marxism and is similar in outlook to 'third-worldism'. The party was founded in 1946 by the Syrian intellectuals Michel Aflaq and Salah al-Din al-Bitar. It has established branches in different Arab countries, although it has only ever held power in Syria and Iraq. In Syria it has had a monopoly on political power since the party's 1963 coup. Ba'athists also seized power in Iraq in 1963, but were deposed some months later. They returned to power in a 1968 coup and remained the sole party of government until the 2003 Iraq invasion. Since the invasion the party has been banned in Iraq. In 1966 a coup d'état by the military against the historical leadership of Aflaq and Bitar led the Syrian and Iraqi parties to split into rival organizations — the Qotri (or regionalist) Syria-based party and the Qawmi (or nationalist) Iraq-based party. Both retained the Ba'ath name and parallel structures within the Arab world, but hostilities between them grew to the point that the Syrian Ba'ath government became the only Arab government to support Iran (a non-Arabic nation) against Iraq during the First Persian Gulf War. Maoism, known in China as Mao Zedong Thought (Chinese: 毛泽东思想; pinyin: Máo Zédōng sīxiǎng), is a communist political theory derived from the teachings of the Chinese political leader Mao Zedong, whose followers are known as Maoists. Developed from the 1950s until the Deng Xiaoping reforms in the 1970s, it was widely applied as the guiding political and military ideology of the Communist Party of China and as theory guiding revolutionary movements around the world. A key difference between Maoism and other forms of Marxism–Leninism is that peasants should be the bulwark of the revolutionary energy, led by the working class in China. Maoism (Third Worldism), often stylized as Maoism–Third Worldism or simply MTW and not to be confused with Third Worldism generally, is a broad tendency which is mainly concerned with the infusion and synthesis of Marxism—particularly of the Marxist–Leninist–Maoist persuasion—with concepts of non-Marxist Third Worldism, namely dependency theory and world-systems theory. There is no general consensus on part of Maoist–Third Worldists as a whole. However, the majority of proponents typically argue for the centrality of anti-imperialism to the victory of global communist revolution as well as against the idea that the working class in the First World is majority-exploited (sometimes arguing that it experiences no exploitation at all) and therefore it is not a part of the international proletariat. In academic discourse, Maoism–Third Worldism is sometimes synonymous with dependency theory or dependencism. Simon Malley (May 25, 1923 – September 7, 2006), was a prominent francophone journalist and a strong supporter of Third World independence movements. Malley was "one of the best known francophone journalists of his generation" and a "partisan, fearless and controversial" writer who spoke and wrote easily in both French and English as well as his native Arabic, according to his obituary in The Guardian of London. Sino-Third World relations refers to the general relationship between the two Chinese states across the Taiwan Strait (the People's Republic of China and the Republic of China) and the rest of the Third World, and its history from the Chinese perspective. Next in importance to its relations with the superpowers—the Soviet Union and United States—during the Cold War were China's relations with the rest of the Third World. Chinese leaders have tended to view the developing nations of Asia, Africa, and Latin America as a major force in international affairs, and they have considered China an integral part of this major Third World force. As has been the case with China's foreign relations in general, policy toward the countries of the developing world has fluctuated over time. It has been affected by China's alternating involvement in and isolation from world affairs and by the militancy or peacefulness of Beijing's views. In addition, China's relations with the Third World have been affected by China's ambiguous position as a developing country that nevertheless has certain attributes more befiting a major power. China has been variously viewed by the Third World as a friend and ally, a competitor for markets and loans, a source of economic assistance, a regional power intent on dominating Asia, and a "candidate superpower" with such privileges as a permanent seat on the UN Security Council. Third World Approaches to International Law (TWAIL) is a critical school of international legal scholarship and an intellectual and political movement. It is a "broad dialectic opposition to international law", which perceives international law as facilitating the continuing exploitation of the Third World through subordination to the West. TWAIL scholars (known as TWAIL-ers) seek to change what they identify as international law's oppressive aspects, through the re-examination of the colonial foundations of international law. Third World socialism was a variant of socialism proponed by Kwame Nkrumah, Modibo Keïta, Ahmed Sékou Touré, Fidel Castro, Julius Nyerere, Salah al-Din al-Bitar, Michel Aflaq, Gamal Abdel Nasser, Juan Perón, Jawaharlal Nehru, Sukarno, David Ben-Gurion, Muammar Gaddafi, Zulfikar Ali Bhutto, Buddhadasa, Walter Lini and other such socialist leaders of the Third World who saw a non-Soviet version of socialism as the answer to a strong and developed nation. It could be argued that the new "turn to the left" leadership in Latin America (see socialism of the 21st century), with its anti-Americanism, connection with less developed Eastern Europe, sense of undeveloped countries/developing countries unity and pro-Arabism/pro-Islamism, is a new kind of Third World socialism. It may be described as an ideologically specific form of Third-Worldism and it is made up of African socialism, Arab socialism, Nasserism, Peronism, Nehruism, Labor Zionism, Islamic socialism, Buddhist socialism and Melanesian socialism. In the field of international relations, the Three Worlds Theory (simplified Chinese: 三个世界的理论; traditional Chinese: 三個世界的理論; pinyin: Sān gè Shìjiè de Lǐlùn), by Mao Zedong, proposes three politico-economic worlds: the First world consisting of superpowers, the Second world of developing powers, and the Third world of exploited nations.The First world comprises the US and the USSR, the superpower countries engaged in imperialism and in social imperialism. The Second world comprises Japan and Canada, Europe and the countries of the global North–South divide. The Third world comprises the countries of Africa, Latin America, and continental Asia. In 1974, the Vice-Premier of the PRC, Deng Xiaoping, explained the Three Worlds Theory at the special session of the United Nations General Assembly on the problems of raw materials and development, about the PRC's cooperation with non-communist countries.As political science, the Three Worlds Theory is a Maoist interpretation of international relations different from the Three-World Model, created by the demographer Alfred Sauvy, wherein the First World comprises the US, Great Britain, and their allies; the Second World comprises the Soviet Union, the People's Republic of China, and their allies; and the Third World comprises the economically underdeveloped countries and the countries of the Nonaligned movement. Tricontinental is a leftist quarterly magazine founded during the Tricontinental Conference. The magazine is the official publication of the Cuban organisation OSPAAAL which also publishes it. It has its headquarters in Havana.The magazine receives much funding from sympathetic European groups.From the founding of Tricontinental in August 1967 until the dissolution of the Soviet Union, which led to a rapid recession in the Cuban economy, propaganda posters were folded up and placed inside copies of the magazine, however, this was stopped, along with publication of Tricontinental, due to ink shortages and financial trouble. Tricontinental began to be printed again in 1995. In 2000, the decision was made to begin to reprint posters. The magazine is distributed around the world, and at its height, 87 countries received Tricontinental, and there were more than 100,000 subscribers, mostly students. At one time, it was very common for posters from issues of Tricontinental to be posted on the walls of student community centres.